Justin Bieber: Never Say Never is a classic story about having a dream and making it happen. Whether you like JB or not, this movie will inspire you to start making your dreams reality! 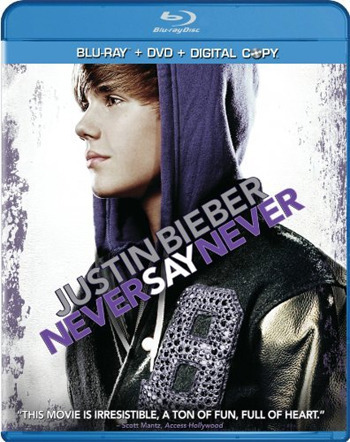 Justin Bieber: Never Say Never is out on DVD + Blu-Ray May 13. Justin Bieber: Never Say Never follows Justin from the very beginning, when he started posting videos of himself singing and making music on YouTube to his sold-out concert at Madison Square Garden. It also introduces you to the VIPs that helped him out along the way: his manager, Scooter Braun, his mom, Pattie, and his mentor, Usher. OK, so it’s not like you’ll be journeying back to a prehistoric era, but this movie takes you back to Justin’s roots – to his hometown of Stratford, Ontario, Canada, and to actual home footage shot when he was a tiny tot. You also get to meet his BFFs from childhood – guys he still hangs out with when he’s not on tour. But the most surprising thing you’ll get from this movie is: Justin really IS just a regular guy. He eats pizza, watches football and, well, just generally lives the dream. Justin Bieber’s Buddy: His Director Jon Chu! Have you seen Jusin Bieber's Movie Never Say Never?